Definitely not your regular muffins , if I may say so. Chocolate chips variety is pretty good but I was getting kind of bored and I figured it was time to try something new, so I loaded these puppies with strawberries and bananas [heh]. Well, hold your negative comments until you try my recipe for yourself, they are AMAZING. 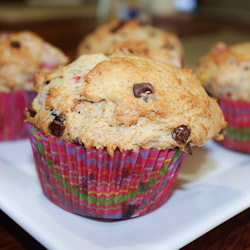 Preheat oven to 350° F / 177° C. Place paper liners on the bottoms of your muffin tray. If you don’t have paper liners, just oil or butter the tray well, so they don’t stick. Wash your strawberries and cut them into little pieces. Get all the dry ingredients together in a large bowl. You’ll need to add the flour, baking soda, baking powder, salt, cinnamon, chocolate chips and strawberries. Mix them all together using a spoon or spatula. Next we need to get the wet ingredients ready. In a medium bowl, mash two bananas using a fork or a potato masher then add the brown sugar, vanilla extract, eggs, and butter. Whisk all the wet ingredients together and when you are satisfied with the result (it should end up looking like a goo heh) pour the flour mixture and give it a swirl. Slowly mix everything together until it is well incorporated. When you are done, pour a big heaping spoon into each muffin liner. This should be more than enough for 12 muffins. Put the tray in the preheated oven and bake for about 30 minutes or until golden brown. To make sure they are done, stick a toothpick in one of the muffins and it should come out clean. Preheat oven to 350° F / 177° C. Butter the muffin tray, or use muffin liners. Clean and dice the strawberries. In a large bowl, add the flour, baking soda, baking powder, cinnamon, strawberries and chocolate chips and mix together. In another medium bowl, mash the bananas using a fork or potato masher. To the bananas add the eggs, melted butter, brown sugar and vanilla extract and whisk everything together. Pour the wet mixture over the dry mixture and slowly mix them together. Don’t over mix. Pour a big heaping spoon into each muffin liner. Bake for 30 minutes or until baked through. You can test it by sticking a toothpick into a muffin and it should come out clean. Love this recipe! Just made them this morning with my son for his birthday celebration, and we both love them! Thank you for sharing, I’ll be stashing this one away in the recipe box for sure. Thank you so much for sharing this recipe! I’m an 18 year old who has a hobby in baking and I believe this has been the best batch of muffins I’ve made by far! My family loved it!